Countdown is on, three days till the Scottish Cup and Festival at Glasgow Green and Kirriemuir are getting ready for their first match in the competition. This is the first occasion that such a huge number of players have decided to travel to the Walking Football Scotland Scottish Cup and National Festival. It promises to be a great day out and provides the opportunity to meet a large cross section of walking footballers from all over Scotland." One of the more pleasing aspects of moving the Scottish Cup and Festival to the larger facility at Glasgow Green from Ainslie Park in Edinburgh is that it gives more teams who have not previously participated in the event the chance to take part and make new friends in the Walking Football community. Like a number of clubs, this will be Kirriemuir’s first visit to the tournament and their players are looking forward to testing their skills against teams like Hearts, Gala Fairydean Rovers, Saints in the Community and Kirkcaldy to name a few. Kirriemuir is a small, rural, town with a population of just over 6,000, situated at the gateway to the Angus Glens, a few miles north of Forfar. The town is the birthplace and resting place of the world acclaimed author J.M. Barrie, and a statue of Peter Pan stands in the town square. In more recent times, ‘Kirrie’ is also associated with Bon Scott of AC/DC fame. 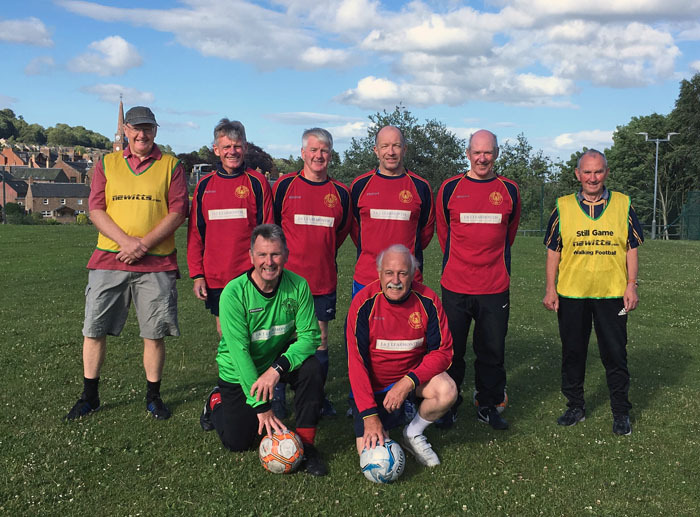 Kirriemuir Walking Football Group became established two years ago and attracts between 8 and 14 at the weekly sessions which take place outdoors on the 3G astro pitch attached to the local Webster's Sport Centre. Ages range from 53-74. Local sponsorship provided balls, bibs and cones. The core of the group previously played 5-a-side football together for many years and a regular in that squad was former Dundee United and Manchester United player Frank Kopel. Because of the limited player resources within the town, recruits travel from further afield from the Angus towns of Montrose, Forfar and Brechin and seven have agreed to make the 200-mile round journey to compete in the event. The team will proudly wear the colours of local junior side Kirrie Thistle. Good luck and safe trip to Kirriemuir. We hope you have a ‘ball’.